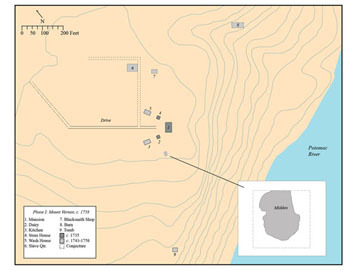 The multi-year South Grove Midden project, led by Dennis Pogue and Esther White, resulted in the excavation of 400 strata, 226 of which were midden deposits. These contexts date as recently as the twentieth century and as extend back in time to the prehistoric period. Our goal was to group these layers into chronological phases to make analysis and interpretation easier. 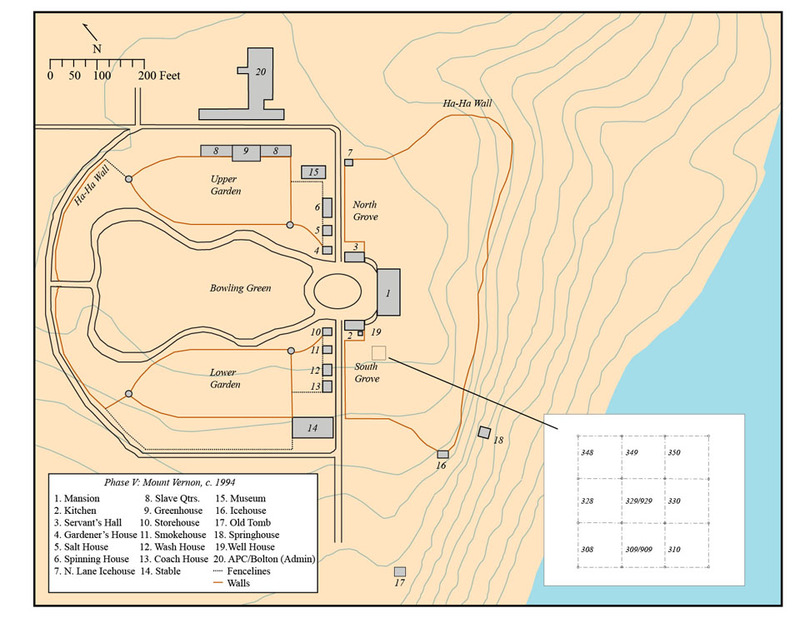 Extensive work on phasing the complex midden stratigraphy (primarily due to disturbance by modern and historic intrusions) based on ceramic seriation, dating, and vessel analysis, tobacco pipe dating, and the integration of documentary sources resulted in six phases. Each object presented on the website is tied to a chronological phase. 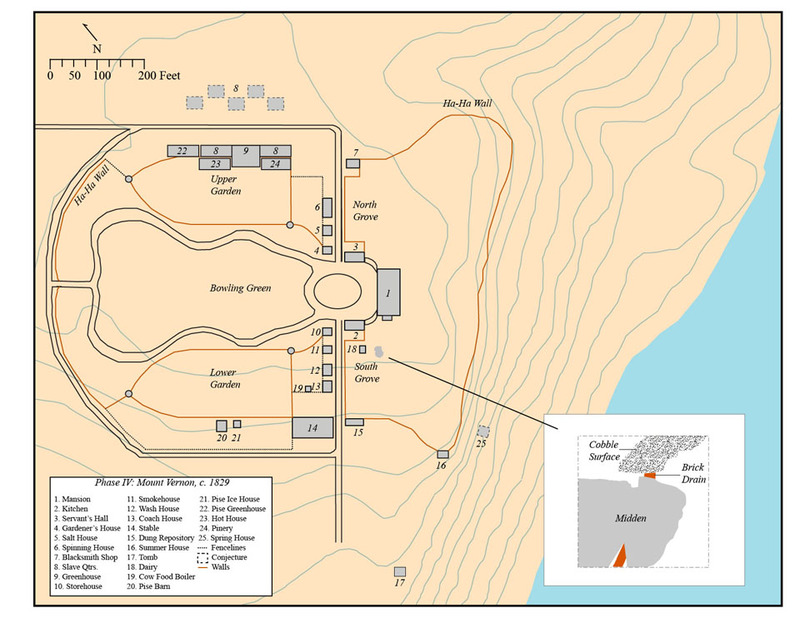 For a detailed presentation of the midden's stratigraphy, visit the DAACS project page. Phase 1 is the earliest group of historic layers in the midden. Phase 1 potentially contains evidence of the Augustine Washington occupation, but because his household's ownership of and residence at the plantation was short-lived, we interpret the bulk of these deposits to Lawrence Washington's period (1743 to 1752). Ceramic vessels with a high degree of reconstructability and the existence of matched sets suggest that Phase 1 represents episodes of cleaning associated with household cycles, particularly at the time of Lawrence's death. These mass dumping episodes were interspersed with refuse generated from daily activities such as cooking and cleaning of fireplaces. Phase 1 is rich in ceramics, glass, tobacco pipes, faunal remains, and small finds (including lead shot, beads, and pins). Object highlights include carbonized plant remains, colonoware, Chinese porcelain, British and German stoneware, imported coarse earthenwares, marked tobacco pipes, scissors, table glass, wine bottle glass, cowrie shells, metallic threads, clay figurines, and buckles and buttons. There are a wide range of avenues for additional research; a few based on findings from Phase 1 are highlighted here. One avenue entails a better understanding of sets of Chinese export porcelain and engraved glassware. Are matched sets of porcelain teawares and plates and decanters and wine glasses (like those found in the midden) common on other mid-eighteenth century archaeological sites? What constitutes a matched set and how early do they appear? Another avenue involves research into museum collections. Phase 1 contains evidence of teabowls and slop bowls – what is the difference in the sizes of these vessel forms? How much bigger is a breakfast teabowl than an afternoon teabowl? Collecting this measurement data from museum collections will facilitate the identification of these forms on archaeological sites. Finally, vessel capacity research using the South Grove ceramics (mugs, punch bowls, and milk pans) should be applied to other sites, exploring hypotheses on genteel consumerism in the eighteenth century. Phase 2 is the second group of historic layers that formed the midden. Phase 2 represents the early George and Martha Washington household. Large deposits of plaster provide the terminus post quem (or date after which the phase was formed), which correlates to the initial renovations of the house undertaken by Washington at the end of the French and Indian War. The terminus ante quem (or date before which the phase was formed) for Phase 2 is the construction of the brick drain, ca. 1775. The builder's trench for the drain intruded Phases 1 and 2. Ceramic vessels with a high degree of reconstructability and the existence of matched sets suggest that Phase 2 represents episodes of cleaning associated with household cycles, such as when George Washington married Martha Custis. Outmoded and worn out objects were interspersed with refuse generated from daily activities such as cooking and cleaning of fireplaces. Phase 2 is rich in ceramics, glass, tobacco pipes, architectural material, faunal remains, and small finds (including lead shot, beads, and pins). Object highlights include carbonized plant remains, colonoware, creamware, Chinese porcelain, British and German stoneware, imported coarse earthenwares, a piece of printer's type, a wig curler, table glass, marked tobacco pipes, painted and molded plaster, metal book hardware, and a thimble. 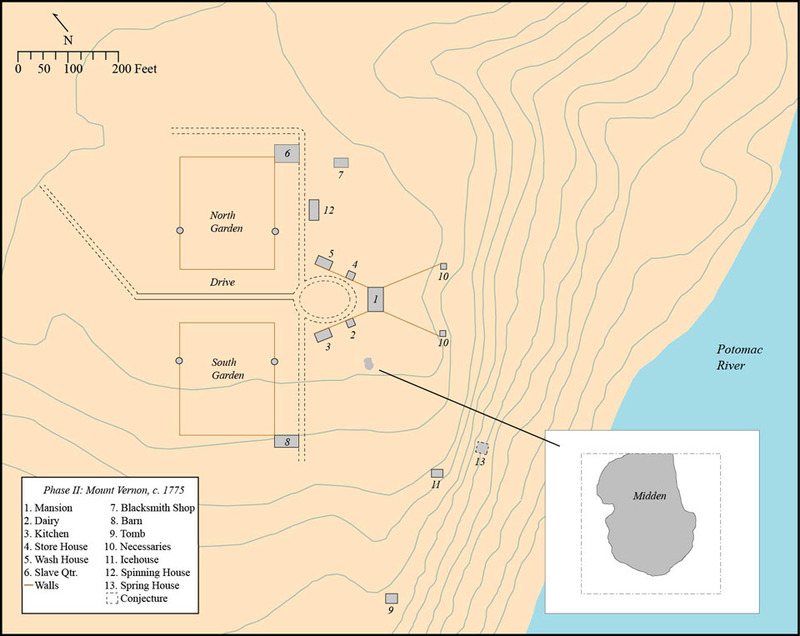 We believe the colonoware assemblage from Phase 2 and the site as a whole to be one of the largest, most reconstructable, and best documented from an eighteenth century plantation site. This assemblage can aid archaeological scholarship on scientific, cultural, regional, and chronological studies of this locally-made wear type. Phase 3 is the final and most recent group of historic layers that formed the midden. Phase 3 dates to the later George and Martha Washington household. 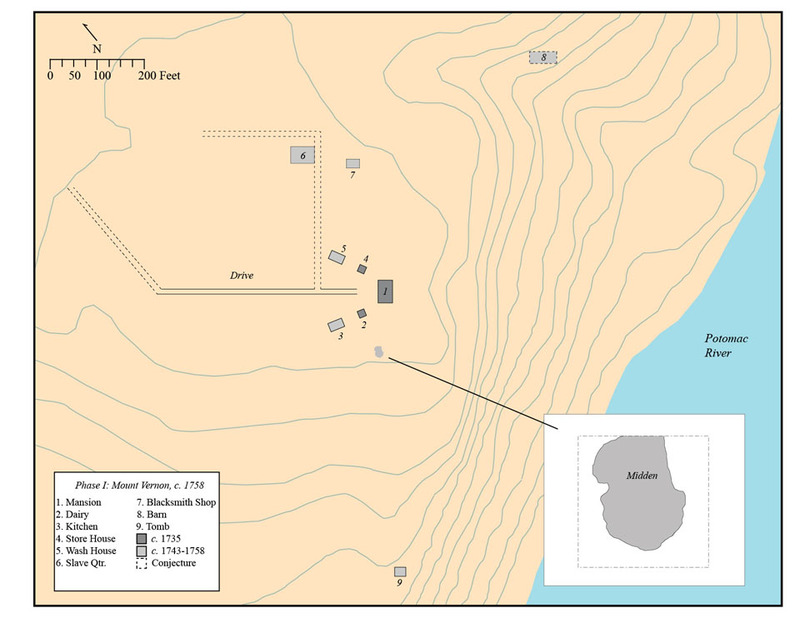 In this phase, there is a significant decrease in artifact and faunal counts, suggesting that not only was Washington planting a formal landscape in the south grove area, but that refuse disposal moved to a different location at this time. The artifacts from Phase 3 are generally smaller in size and not as mendable as those in the previous two phases. 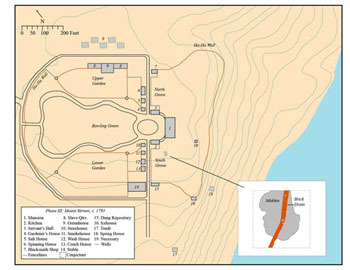 The nature of the deposits in Phase 3 offer compelling evidence about changes in Mount Vernon's landscape and homelot at the end of the eighteenth century. In addition to objects redeposited from earlier phases, highlights include pearlware, creamware, American stoneware, tobacco pipes with armorial decorations, an umbrella tip, and a fork fragment. 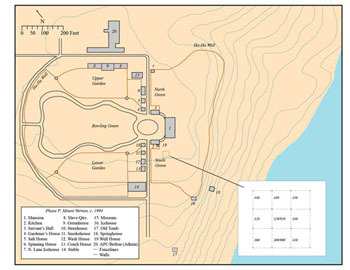 Avenues for future research might include a study of changes in the diets of the Mount Vernon households over time (between Phases 1, 2, and 3) and comparisons with other deposits at Mount Vernon like the House for Families slave quarter or on other plantation sites. For example, is there a way to distinguish between those food remains from the plates of the Washingtons versus those from the slaves who lived and worked on the estate, and how does this change over time? Or is the picture much more complicated, as might be expected based on research into other artifact classes? Historians and faunal analysts (Walsh et al. 1997) have suggested that distinct sub-regional dietary differences within the Chesapeake (between the lower tidewater and the upper tidewater, where Mount Vernon is located) existed. How does Mount Vernon fit within this framework? Are differences in sub-regional diets influenced by environmental, agricultural, or cultural factors, or a combination? Phase 4 is the first group of historic layers that post-date George Washington's occupation of Mount Vernon. After Washington's death in 1799, Martha lived at Mount Vernon until her passing, in 1802. The plantation was handed down through three heirs: Bushrod Washington (1803-1829); John Augustine Washington, II (1830-1832); and John Augustine Washington, III (1841-1858). Few layers and artifacts were deposited during these 60 years; therefore they were grouped into one phase. There appears to have been a cobbled surface in the vicinity of the midden during this phase, and a large concentration of architectural debris. In addition to objects redeposited from earlier phases, highlights include whiteware, yellowware, and American stoneware. 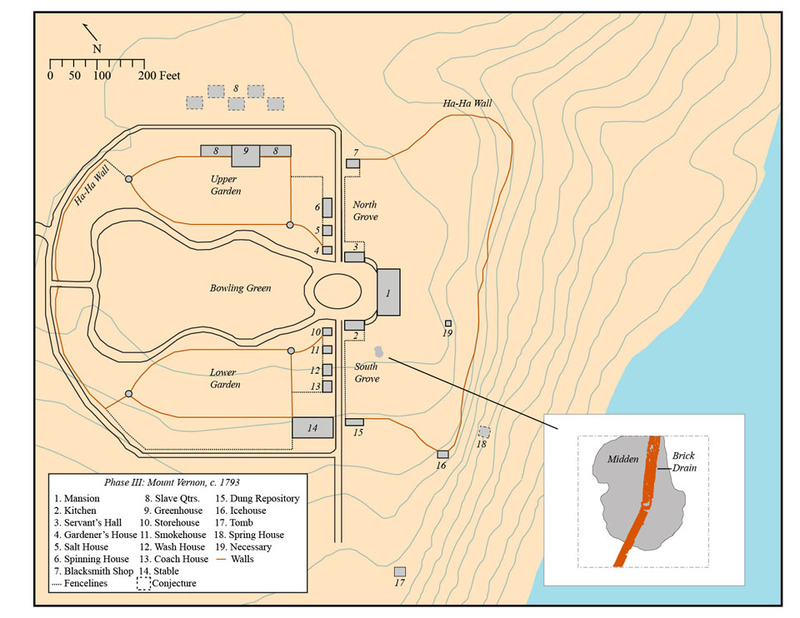 Phase 5 is the final and most recent group of historic layers excavated from the site. 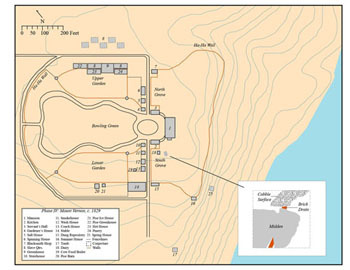 This phase represents the transition of the estate from a working plantation to a museum. John Augustine Washington, III sold the property to the Mount Vernon Ladies' Association in 1858. In addition to objects redeposited from earlier phases (due to utility line intrusions), highlights include items left behind by visitors to the museum – trolley tokens, a brownie ring, and camera flash bulbs. Phase 6 layers represent the pre-historic ground surface underlying the midden's historic layers. The bluffs along the west bank of the Potomac River, where Mount Vernon is located, are composed of sedimentary rock, which has contributed to the estate's gently rolling topography and the moderate slope south, north, and west of the Mansion. The ground surface of the south grove had natural swales, and the midden's placement likely took advantage of an area of low ground that could be leveled by infilling with household trash. The topography drops precipitously to the east from about 115 feet above mean sea level at the Mansion down to the river. Object highlights include prehistoric projectile points and steatite fragments. The prehistoric artifacts found in the midden remind us that the prominent rise above the river upon which Mount Vernon sits today offered an attractive seasonal hunting, fishing, and feasting ground for Native Americans. Excavators identified no prehistoric features, but intact soils of Phase 6 underneath the historic layers represent where Native Americans were living. Projectile points primarily date to the late Archaic period, 5,900 to 3,200 years ago. 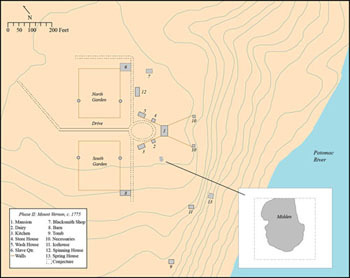 Research projects could include a comparison to late Archaic sites across the river in Maryland. Are the lithic types and materials similar? How might trade routes be reflected in lithics in this riverine environment? 1997	Provisioning Early American Towns, The Chesapeake: A Multidisciplinary Case Study. Report for the National Endowment for the Humanities (RO-22643-93), Washington, DC.